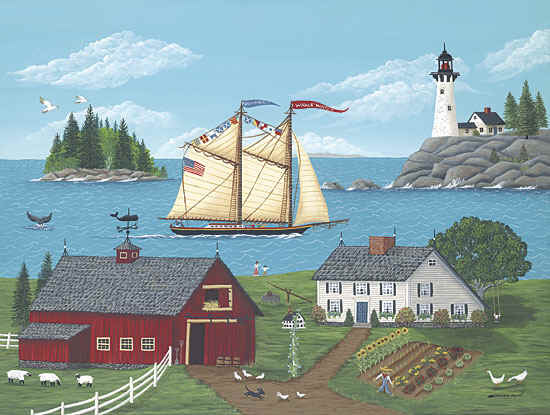 Somewhere in the world, those infamous “they” decided that June 15th is National Lobster Day! Don’t ask me why because I haven’t a clue. But I’d be willing to celebrate “Lobster Day” any time. Lobster and turkey are my 2 favorite foods. 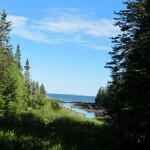 Every year Bill and I head down to the coast to Machias, Maine to have Lobster Rolls at the Bluebird Ranch. They have the best Lobster Rolls I have ever had. Just yummy! And their Lobster Stew is to die for! Heaven in a bowl! 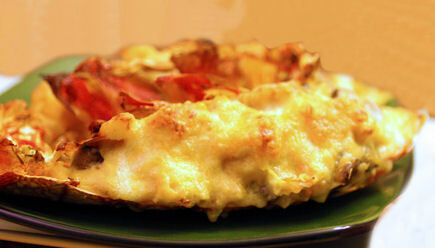 Now once you have your Lobsters, here are some of my favorite Maine Lobster Recipes. Maine Lobsters turn a bright red after they are boiled. This is the quickest and easiest way to cook lobster. Some people are a little squeamish about putting the live lobsters into boiling water but that’s the way it’s done. It does help to put the lobsters in the freezer for about 15 minutes before you cook them. This slows down their metabolism and makes them easier to handle when inserting them into the pot. They tend to flail their front legs around if you don’t sometimes bracing them against the lip of the pot. Lobster wrestling is not fun! 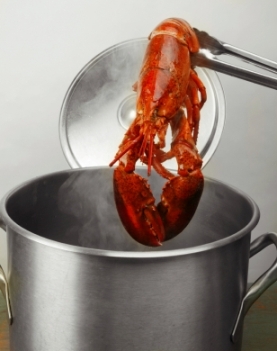 Plunge live lobsters into kettle of boiling salted water, head down. Cover and boil for 20 minutes. They die very quickly and they do not make any noises. 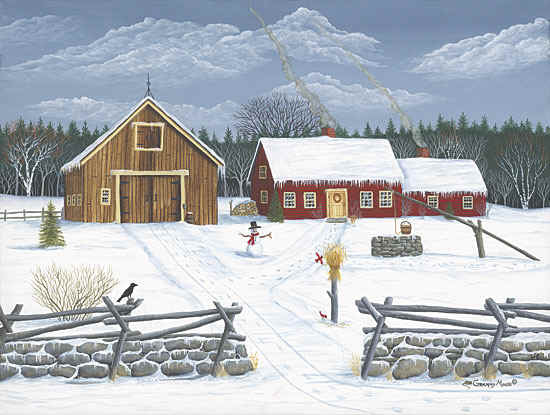 (The first time my faint-hearted mother was going to cook lobsters, my big tease father told her that they would scream when they touched the hot water. They don’t! ) Remove from the water and serve whole with a side dish of drawn butter. Nutcrackers are a handy tool to include in your place setting, and also an empty soup bowl to put cracked shells. It can be a messy meal so lobster “bibs” are a nice addition too. 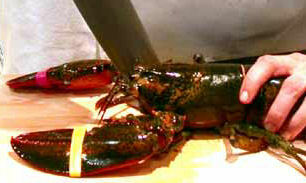 Quicker yet is to plunge the tip of a sharp knife straight down right behind the lobster’s eyes. There is a spot about an inch and a half behind the lobster’s eyes. It is a sort of line of demarcation in the shell. 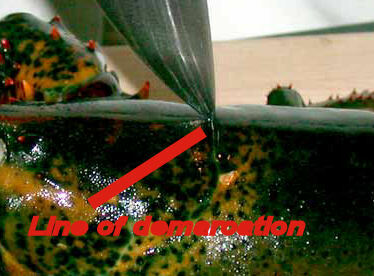 Insert a sharp knife in the small ridge/ demarcation line about 1 1/2″ behind the eyes. 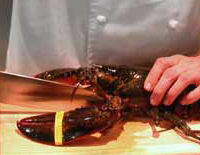 Hold the lobster by the area where the tail meets the body, pressing the body against the cutting board. Take a sharp chef-style knife and insert it into the shell at that spot. Cut through the shell bringing the knife down between the eyes. Cut all the way through the Lobster down to the cutting board below. Cut all the way through the head down to the cutting board. You can then steam, boil, broil, or stuff the lobster as you would like. This recipe was given to me by an old friend, Helen Stella, and was a popular way to prepare lobster back in the 1970’s. Cut lobster meat in small pieces and cook in butter for 3 minutes; then add wine and cook another 3 minutes. Beat egg yolks and cream; stir slowly into the lobster and continue to stir until the mixture thickens. Add seasonings. Do not overcook, as the sauce will curdle. Serve over toast points with a crisp salad. I can not begin to say how much I love lobster! Have always been afraid to cook it though. Well done! 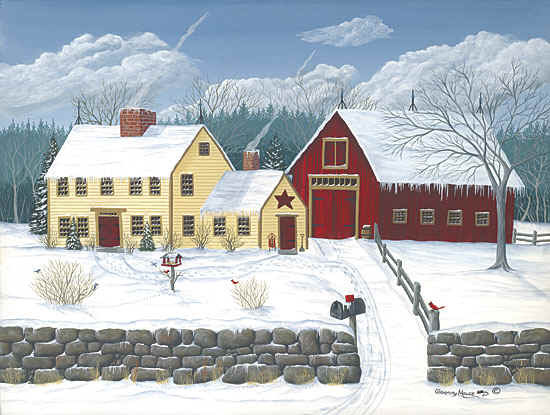 Thanks for sharing at All Things Pretty! I love lobster but i jucant make it lol-looks yummy! Are you squeamish about putting a living creature into boiling water? That bothers me too so I choose to quickly dispatch them with a knife before boiling as I think it is a more humane method!